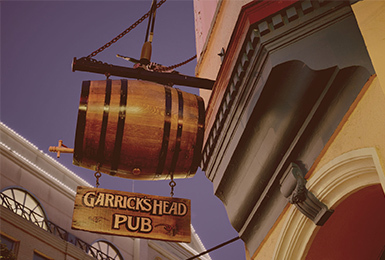 Nestled in Victoria’s beautiful and historic Bastion Square, Garrick's Head Pub has been a local fixture since 1867, in the days when Judge Matthew Begbie presided over the local court house. 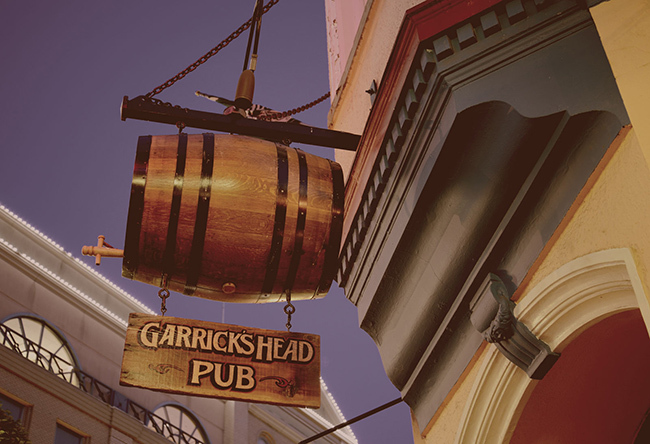 Simply put, we are one of the oldest English pubs in Canada and maintain Victoria’s largest selection of craft and import beers on tap. If you’re hungry, we offer traditional English pub fare in a bright and relaxing atmosphere. 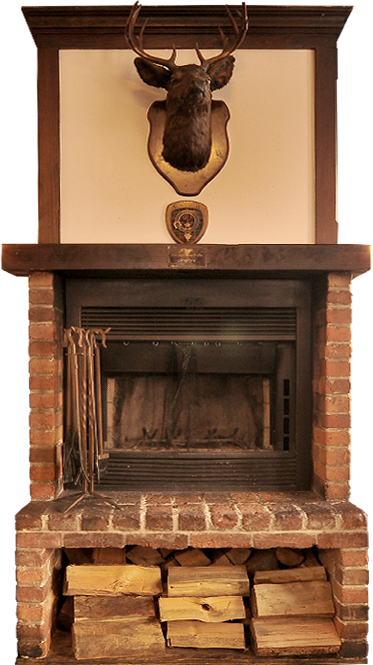 Customers are welcome to linger around our wood-burning fireplace to warm away the cool days and nights. As of 2012, our newly expanded front room offers ample space for dining and socializing and in the warmer months, our outdoor patio seating, overlooking the square, is a fantastic spot to enjoy the sun and to watch the crowds go by. A Fine Place for a Final Meal. Before housing the BC Maritime Museum, the large building across from Garrick's Head in Bastion Square was Victoria's first courthouse. In those early days, Judge Matthew Baillie Begbie presided over Victoria's rowdy mining labour force as our city scraped its way into civilized existence. Early Victoria had its fair share of murderers and so Begbie handed out a healthy portion of sentences with a noose attached to them. Despite his nickname "The Hanging Judge," and what many folk tales of early Victoria profess, Begbie was not fond of delivering death sentences. Tales of Murder in Victoria, BC. 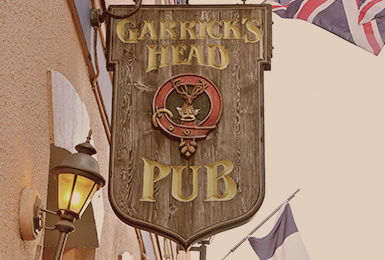 The Garrick's Head Saloon (the pub's previous incarnation) opened on December 31, 1867 and lasted until 1914. Owner Mike Powers purchased it in 1899 after selling the Brown Jug Saloon. "It was about 3am on Sunday morning October 1, 1899 as Mike stooped to unlatch his front gate that something struck him from behind. A towel wrapped around five pounds of sand caught Mike on the back of his neck and upon contact split open, drenching him with its dusty contents. City police later learned that Powers' attackers were two people, one possibly a woman dressed as a man. It was the male attacker who apparantly wielded the sandbag after which in a frenzy rage, he proceeded to kick Mr Powers into oblivion." Powers died four days later at the Jubilee Hospital from a ruptured liver. The attackers were never found and brought to justice. The motive was not robbery but was suspected that a previous wife and her lover decided to demonstrate their hatred of Mr. Powers. 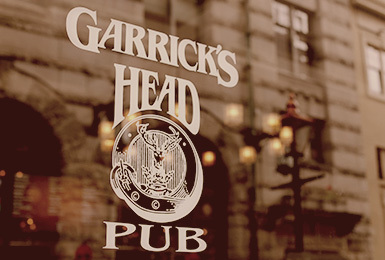 After over 125 years serving ale and food to Victoria patrons, Garrick's Head was presented with an opportunity to expand in the fall of 2012. 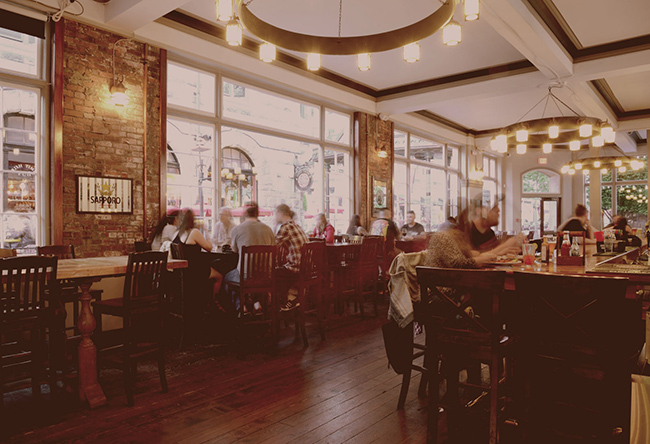 The space between the old pub and Government St. became available and the pub's owners decided that Victoria was ready for both more space and many more beer taps. After months of planning and licensing meetings with the City of Victoria, Garrick's Head opened its brand new Government St. doors in November of 2012. The high visibility pub front on one of Victoria's busiest streets has resulted in a lot more exposure to tourists and also craft-beer-hungry locals. 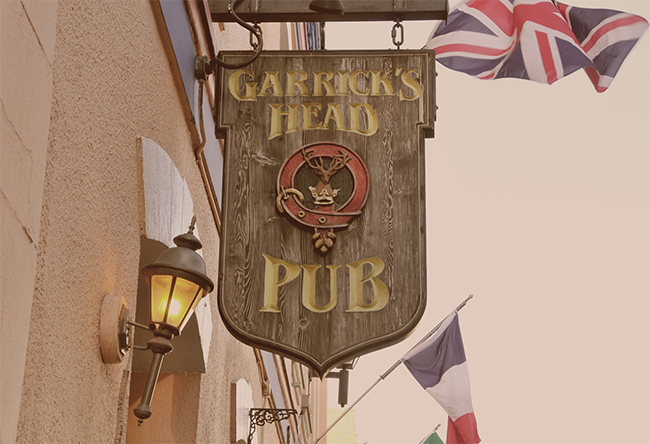 The increase in size also allowed Garrick's to add draught lines, expanding their craft beer tap selection to the largest on Vancouver Island – if craft beer is your drink of choice, then Garrick's Head is a safe bet for you. Apparently, We're Quite The Looker! 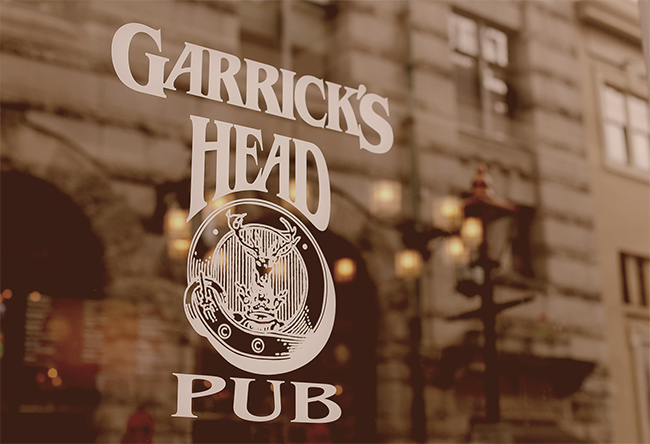 Over our 125+ years as a pub, Garrick's Head has seen many variations on our logo and style. 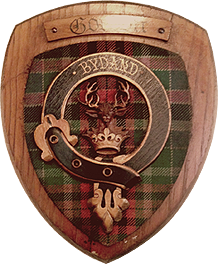 Without a doubt, the elk head coat of arms mounted above our fireplace in the old pub is the root of all of our iconography; despite its foggy origins and backstory, this same imagery was used on the hanging tavern sign and also our windows. Victoria is the cradle of the craft beer revolution and with the quality selection of local breweries, we are proud to serve the largest selection of craft beer on Vancouver Island. We keep all our local breweries on tap and feature a wide variety of craft beer from Vancouver and across the rest of the province. 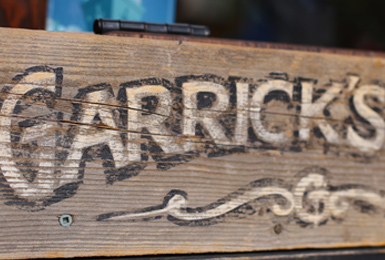 Pub manager Jay Nowak started in 1999 in the kitchen, cooking up classic Garrick’s Head burgers. He eventually moved behind the bar in 2000, pulling draft from the 10 taps that were then on hand. In those days, the pub poured a hell of a lot of Guinness and Okanagan Pale Ale. 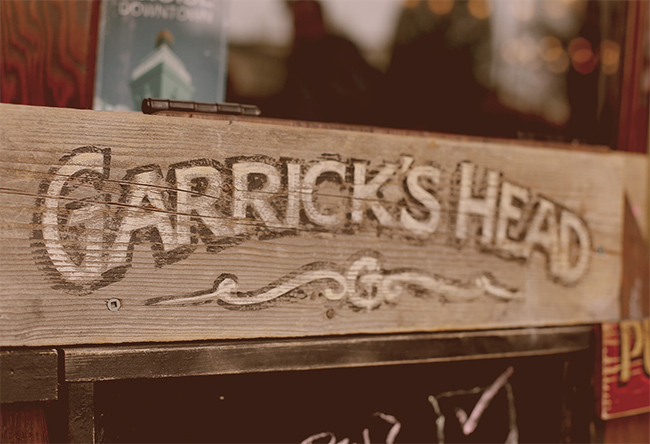 Ever quick to support the local beer community, Garrick’s Head was the first place in Victoria that had both Phillips and Vancouver Island Brewery on tap. By 2002, Nowak had assumed managerial control of Garrick’s and was taking on all manner of quality BC craft beer.